Nick Page. Simply the Bible. Oxford: Lion Books, 2013. Kregel recently sent me a copy of Simply the Bible by Nick Page. The publisher describes the book as follows. My initial and cursory impressions are positive. 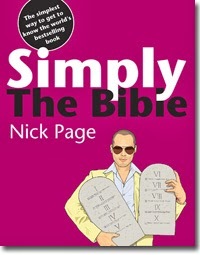 Simply the Bible provides a succinct and helpful overview of each biblical book. One might disagree here and there with what the author has chosen to spotlight but such is expected in a work like this. Novice Bible readers will find help in getting the big picture and more advanced teachers and preachers can find material to incorporate into lessons and sermons. One final note: the advice of not judging a book by its cover might apply here. I found the cover a bit “cheesy” for my tastes, but one of my daughters noted that the style was common among younger readers.